Good news for Moto Z Play Users, Latest Official Android 7.0 Nougat update for Moto Z Play starts rolling out. Previously company rolled out the Nougat update for Moto Z and Z Force and now released the official stable Android 7.0 Nougat for Moto Z Play. The official Android 7.0 Update for Moto Z Play is rolling via OTA and soon you will receive the notification. You can wait for the OTA updates, or you can Update Moto Z Play to Android Nougat manually. Download Android 7.0 Nougat update for Moto Z Play from below. The new Android 7.0 Nougat OTA update for Moto Z Play packed with features like Multiwindow, Doze, Improved Notifications, New Messaging Apps, Seamless update, Vulkan API, along with other features. You can check the infographics of best Android Nougat Features. The Moto Z Play Nougat Update is available via OTA (over-the-air), and it is about 880MB in size. 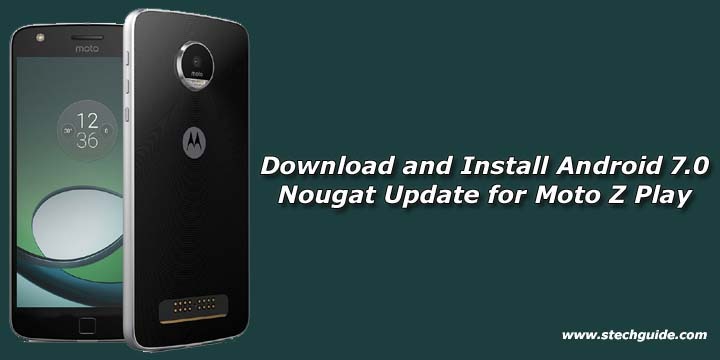 Here we provide you the OTA zip file for Moto Z Play with that you can update Moto Z Play to Android Nougat manually. Download Android 7.0 Nougat OTA zip file for Moto Z Play from below. This method only works on Moto Z Play, don’t try it on other devices. 4) Download the NPN25.137-24-1 OTA zip from above Copy ROM to a folder where adb installed. This is the easiest way to Download and Install Android 7.0 Nougat update for Moto Z Play. Let us know your thoughts about Moto Z Play Nougat update in the comments below. This method works on the moto Z play model XT1035-03 retcn?